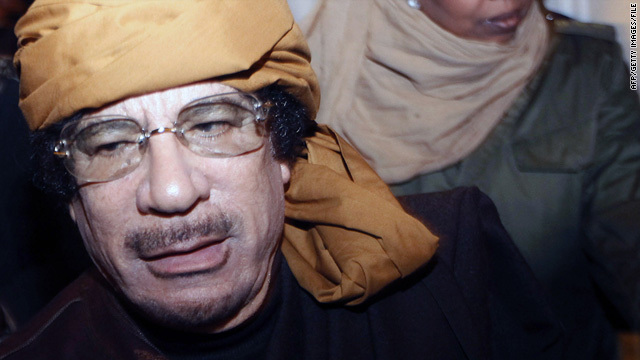 (CNN) -- Libya's rebel leader says he does not have a problem with Moammar Gadhafi remaining in the country, once he resigns and as long as he remains under supervision, according to a television report. Mustafa Abdel Jalil contradicted earlier opposition statements that Gadhafi's exit from the country was an absolute prerequisite to bring about the end of the months-long conflict. It signaled a possible willingness to negotiate with the Libyan leader to bring about an end to the fighting. In a Reuters Television report Sunday, Jalil made the comments while reacting to a proposal put forward by the African Union, which rebels have interpreted to mean Gadhafi should have no further role in the country's leadership. Jalil told Reuters once Gadhafi resigns, "At that point he can decide if he would stay in Libya or abroad." "If he desires to stay in Libya, we will be the ones to determine the place and there will be international supervision on all his movements and communications," he said during an interview in the rebel stronghold of Benghazi. Jalil took the reins of the rebel movements after resigning from Gadhafi's government in February over what he saw as excessive use of force against demonstrators calling for the leader's resignation. Libyan government spokesman Musa Ibrahim has previously said the prospect of a peace deal would be welcomed, but not one that rested on Gadhafi's departure. Libya's Deputy Foreign Minister, Khaled Kaim, noted Monday that talks between government officials and rebel leaders are continuing on multiple levels, including daily phone conversations. He expressed optimism that the talks could have a positive outcome if NATO's air campaign is halted. Kaim said Italian officials had granted travel visas to certain individuals to help facilitate the talks outside of Libya. But Maurizio Massari, a spokesman for the Italian foreign ministry, denied Kaim's assertion. The fighting in Libya, meanwhile, was slated to take center stage Monday at a meeting between NATO nations and Russia. The meeting brought together countries who support the airstrikes targeting Gadhafi's forces and one of the biggest critics of the bombing campaign. NATO Secretary-General Anders Fogh Rasmussen was scheduled to meet with Russian President Dmitry Medvedev as part of the Russia-NATO Council meeting in Russia's Black Sea resort town of Sochi, Russia's state-run RIA Novosti news agency reported, citing the Kremlin. Russia has been a critic of the NATO bombing campaign that began in March after the U.N. Security Council approved a resolution for the use of force, with the exception of a ground invasion, to protect civilians. Russia, a member of the Security Council, abstained from the vote. "Special responsibility in the search for a political-diplomatic solution to the crisis lies with regional organizations, above all the African Union, and the UN secretary general's special envoy," the Kremlin said, according to the news report. The meeting followed reports Sunday of fierce fighting in western Libya, where Gadhafi's forces have been shelling the towns of Yefren and Kikla, east of the rebel stronghold of Zintan. The shelling began three days ago, according to Mazigh Buzakhar, who works for an opposition media group. Buzakhar said clashes in the western Nafusa mountains on Sunday killed two rebel fighters and wounded 11. CNN cannot independently confirm Buzakhar's account. Conditions in the embattled towns in the Nafusa mountains are bleak, with no electricity and a shortage of water, Buzakhar said. Rebels have been battling Gadhafi's forces for months in an attempt to bring about an end to the Libyan leader's 42-year rule. The rebels received a financial boost Sunday when Turkish Foreign Minister Ahmet Davutoglu pledged $200 million in support to the opposition. Davutoglu made the pledge during a meeting with Jalil in Benghazi, the foreign ministry said. The Foreign Ministry told CNN Monday that Turkey recognizes the opposition in Libya as legitimate representatives of the country, however, it does not mean the rebels are recognized as the sole representatives. Turkey has not cut off its diplomatic relations with Gadhafi's government, the ministry said. Gadhafi has been under international pressure to step down, and the International Criminal Court at The Hague issued a warrant for his arrest as well as for the arrest of his son, Saif al-Islam Gadhafi and his brother-in-law Abdullah al-Sanussi. On Sunday, South African President Jacob Zuma traveled to Russia to discuss efforts to end the fighting in Libya, just days after he and other members of the African Union said they would not cooperate with the International Criminal Court's arrest warrant for Moammar Gadhafi. Zuma and others were attending a meeting of the International Contact Group on Libya -- a group of NATO countries, Arab nations and other countries working to bring about an end to the months-long conflict. The African Union said its members will not cooperate with the ICC's arrest warrant for Gadhafi, arguing that the measure jeopardizes efforts to negotiate a peace deal in the war-torn nation. Libya is not a signatory to the Rome Statute, which established the international court's authority, and the court does not have the power to enter Libya and arrest the leaders. CNN's Ivan Watson, Yasmin Amer and Yesim Comert contributed to this report.